As a non-creative mom, I was dreading the Valentine’s Day party at preschool…. just like I now dread birthday parties and all other kid related events. Over the top thematic, unique and detailed craftiness of others is really hard to live up to. And I get it, Pintrest was made for people like me to get inspired ideas and find little ways to spice up our bland lives. I am 100% positive I would love it and become addicted to searching and pinning recipes, cool kid crafts and domestic ideas. Which is exactly why I have avoided it like the Plague. There is no room in my life for another online addiction. Email, Facebook, news (not really, but I want you to THINK I take the time to read current events. I am hoping to improve on this), and my volunteer efforts keep me tied to my computer and smart phone waaaayyy more than I would like. So this week I have tried to join the When at Home blog in her Tech Free Challenge. I have been more conscious about putting the phone away, on a shelf, and not carrying it in my pocket. It greatly reduces the urge to check it while playing with the kids. I have tried to keep it away during meals, when normally I take advantage of them be confined and occupied so I can squeeze in a few moments of “productivity.” A shocking thing happened. Meals were enjoyable and actually a little less messy. Maybe it would be easier to ensure the food goes in the mouth, rather than just check out and then clean up the tornado wreckage after. 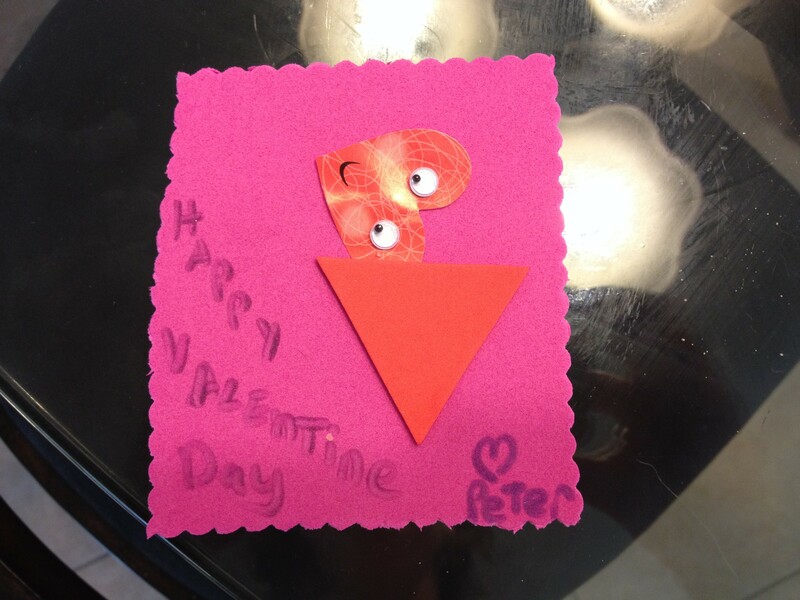 On Tuesday, Associate P’s school reminded us to bring valentines in on Thursday to share with his little friends. I panicked. I knew, with 100% certainty that other moms were on Pintrest right then creating something that would be adorably awesome. I knew all I had to do was log on, create and account and I too could be a crafty creative mom and wow these 2 year olds with a Valentines Day Pun they have zero chance of understanding. But we had a very busy week. The CEO works extra long hours on Tuesdays and I’d be on my own for bedtime (read: the house will get destroyed and take an hour to rebuild after the kids are down), I still had 3 loads of laundry to fold, I had legitimate volunteer business to attend to. We had play dates, gymnastics and a much needed moms night out Wednesday. I did not have time to try Pintrest this week, I was going to have to make it through another holiday on my own. It isn’t pretty, but Associate P and I made 8 little Valentines. He helped cut and put stickers on. I sloppily wrote Happy Valentines Day on them. And you know what, we had fun doing it. We sent him to school yesterday with a brown sandwich bag filled with our little creations and 2 Hershey’s kisses for each kiddo. No ribbons, designer stamps or puns were used. I prayed that the other moms would think ours were sweet and cute, not lazy and sloppy. When I picked him up and looked through the bag of Valentines he would get, there was only one Pintrest Valentine. I was so relieved. The rest were store bought with a piece of candy. A few had let the kids scribble on the cards. We are all moms, just trying to get by, doing the best we can. There is a time and place for Pintrest and I love the idea of it. But I’ve come to terms that I’m choosing to express my creativity in another way, and that’s ok.